If you have any questions about the TAMARA RD by CNL Yachts information page below please contact us. 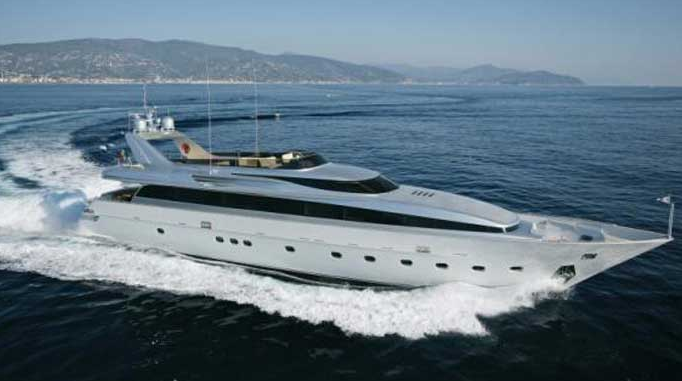 The 34.98 metre super yacht Tamara RD was launched in March 2010 by the Italian Shipyard CNL (Cantieri Navali Lavagna). 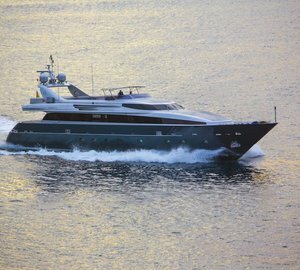 Tamara RD superyacht is one of the CNL Admiral series of semi-custom fast planing motor yachts. She measures just under 35 metres in length overall and was designed by Luca Dini. She is ABS classed as well as MCA compliant. The CNL Admiral 35 superyacht Tamara RD accommodates up to 10 guests in 5 cabins. She is propelled by twin 2775hp MTU diesel engines giving her a cruising speed of 28 knots and can reach a maximum speed of 30 knots. TAMARA RD by CNL Yachts can accommodate a maximum of 10 guests in 5 cabins. We do have available further amenity, owner and price information for the 34.98 m (114'76'') yacht TAMARA RD by CNL Yachts, so please enquire for more information. The luxury yacht TAMARA RD by CNL Yachts displayed on this page is merely informational and she is not necessarily available for yacht charter or for sale, nor is she represented or marketed in anyway by CharterWorld. This web page and the superyacht information contained herein is not contractual. All yacht specifications and informations are displayed in good faith but CharterWorld does not warrant or assume any legal liability or responsibility for the current accuracy, completeness, validity, or usefulness of any superyacht information and/or images displayed. All boat information is subject to change without prior notice and may not be current.